For Baby Milk Action and its partners in the International Baby Food Action Network (IBFAN) this is just the tip of the iceberg as they document malpractice by Nestlé, Danone and other baby food companies around the world. 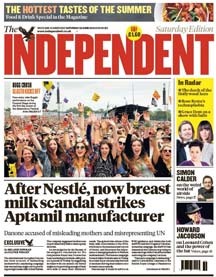 “It is very welcome to see such prominent coverage of this example of baby food companies breaking the rules. Nestlé and Danone are the largest and second largest baby food companies in the world and both systematically violate the marketing requirements. They are engaged in a marketing war, which has just reached the UK with Nestlé takeover of Pfizer Nutrition/Wyeth and the SMA brand of formula in December 2012. “Nestlé is worse than Danone on a global scale and continues to be the target of a boycott. At present Nestlé is leading industry attempts in the Philippines to drastically weaken marketing regulations introduced in 2007. Nestlé’s campaign against regulations in the Philippines – click here. Demonstrations at Nestlé health worker events in the UK – click here. Campaign against Danone’s aggressive marketing in the UK – click here. For further information, contact Mike Brady or Patti Rundall on 07786 523493.